Nipah virus: Kerala's Kozhikode is on high alert as a deadly virus called 'Nipah' (NiV) claimed six lives in the state. The fast-spreading virus Nipah reported has a mortality rate of 70 per cent. The central government on Monday sent a multi-disciplinary Central team from the National Center for Disease Control (NCDC) to the district in the wake of deaths due to Nipah virus outbreak. Kerala Government has assured that all arrangements are on place and there is no need to panic. It also sanctioned an emergency fund of Rs 2 million (Rs 20 lakh) to the Kozhikode Medical College to tackle the fever outbreak. Nipah virus infection can occur in humans or animals. Fruit bats from the Pteropodidae Family are thought to be the natural carriers of the disease. The first major outbreak of NiV in 1998 that left more than 100 people dead in Malaysia supposedly saw domesticated pigs as the hosts, according to a report by the World Health Organization (WHO). In 2001, the first outbreak occured in India in the state of West Bengal and was attributed solely to fruit bats. In 2001, many in Bangaladesh fell ill after consuming palm sap which had been contaminated by the fruit bat. WHO also stated that human to human transmission is also seeing a steady rise. 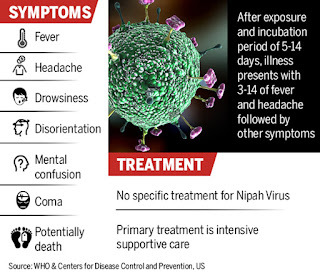 What causes Nipah virus infection? The incubation period for the virus ranges from 5 to 14 days and symptoms become visible after this period. Symptoms include fever, head ache, fainting and nausea. In some cases, symptoms like choking, stomach pain, vomiting, fatigue and blurred vision could also be there. The patient can possibly go into a coma just two days after the symptoms begin. The chance of contracting encephalitis that affects the brain is also high. Take caution to ensure that food is not contaminated by bats. Take precautions to ensure bats don’t eat the food or drop feces on it. Do not eat fruits that may have been bitten by bats. Do not drink toddy that is brewed in open containers near palm trees. It is also important to safeguard oneself after coming in contact with someone who has contracted the virus. It is important to maintain a distance from the patient, to sanitise and wash hands thoroughly. Clothes, utensils and items typically used in the toilet or bathroom, like buckets and mugs, should be cleaned separately and maintained hygienically. A detailed post by InfoClinic in Malayalam says that it is important to cover one’s face while transporting the dead body of anyone who dies after contracting Nipah fever. The post also says that relatives should try refrain from hugging or kissing the dead person and should take utmost care while bathing the body before cremation or burial. At present there is no vaccine present to tackle the Nipah virus, however other preventive measures have been suggested by experts. Most infectious diseases specialists, including Dr Benjamin A Satterfield from the Department of Microbiology and Immunology at the Mayo Clinic, have suggested that tackling risk factors may be more effective than vaccines themselves. “Preventing humans from being infected through non-vaccination efforts will perhaps play an even more important, and less expensive, role in controlling NiV disease,” he had stated.